Following our 12 hour bus journey, we were all pretty shattered, so of course instead of just getting to the hostel and going to bed, we ventured out into the city to find food and drink. After a satisfactory feed though, we crashed into our beds for a good nights sleep, having a lie-in the next day before heading to the Eaton Centre, a MASSIVE shopping mall, where we spent a few good hours perusing the shops and making some pretty big dents in our wallets. Next it was onto the ball game. Baseball to be precise, a game I really know nothing about, so it was exciting to be experiencing a whole new sport for the first time. 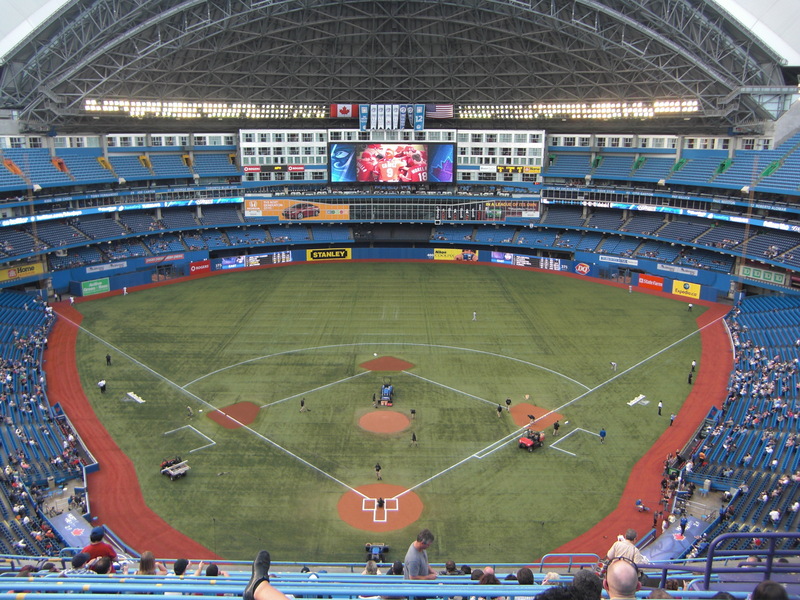 It was the Toronto Blue Jays vs. the Kansas City Royals, in the 60,000 seater Rogers Centre (which was actually only about half full for this game), an enormous place that, when full, I would imagine it to be incredibly atmospheric. It ended with the Royals winning 6-4, but no matter – it was a great experience that I thoroughly enjoyed, even though none of us understood what was going on for most of the time! As part of our trip to Niagara Falls, we also got taken to the local village…a very touristy place that to be honest I wasn’t a massive fan of, but they do have some awesome ice cream! Anyway, onwards to a winery (also included in our Niagara tour, which we got at a discounted price from our hostel – review to come), where we tasted some delicious wines…my favourite being the Icewine, a speciality wine that is sweet and syrupy, suiting me down to the ground! By the time we returned to the hostel, everyone was exhausted, so we all crashed for a bit before getting ready for another night out…this time we headed in a different direction and ended up in a gay bar, where we danced the night away to all the best tunes. Our last full day in Toronto started with another early morning (I can’t wait to sleep on the beach in Miami) as we headed out in search of the open top city tour bus. 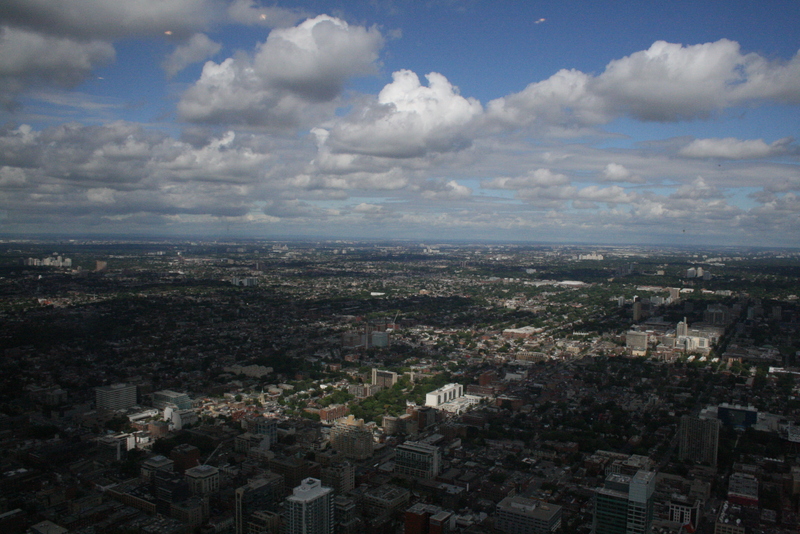 However, the bus stop we were supposed to be getting picked up from was not in service, so we decided to take ourselves on our own tour and went off in the direction of the CN Tower, one of the tallest towers in the world, standing at 553.33 metres. 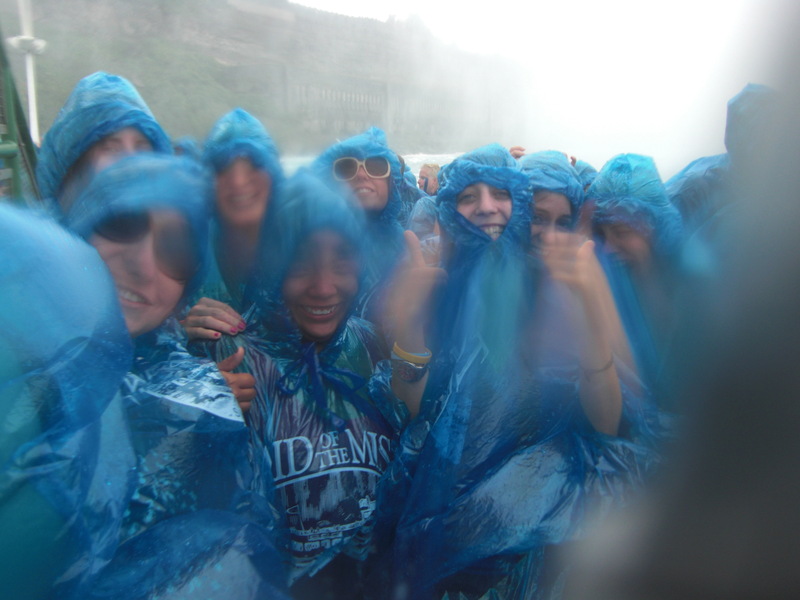 And what an incredible sight when you reach the top (or the observation deck, which is as high as our tickets allowed)…on a clear day like this you can see for miles, some days even as far as Niagara Falls! And now, our time in Toronto is drawing to a close, with most of us getting up pretty early in the morning to catch our flights to Miami for a well deserved break and some time in the sun (fingers crossed we can actually fly – Hurricane Irene is wreaking havoc all over the place!). *My friend Stevo Begbie was the organiser of the whole trip, hence the ‘Begbie Tours’ – he even has his own slogan…’Taking You Where You Beg2Be’.